USD/JPY was higher today at 123.85. The yen did not react strongly after the Bank of Japan’s monetary policy meeting today. Policy makers reduced the growth outlook somewhat in line with recent economic data. Monetary policy was however left unchanged. 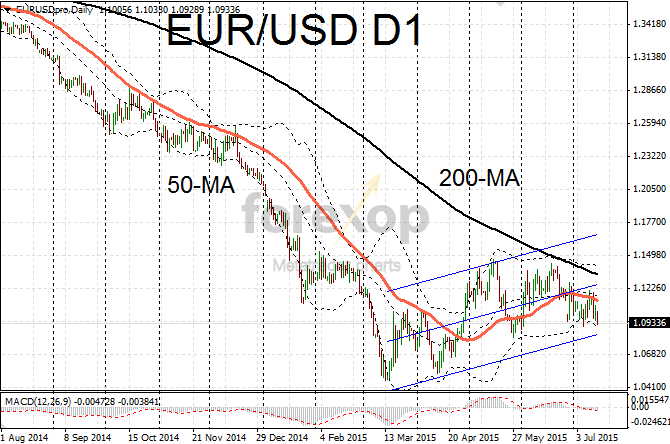 The euro was weaker overall and this reflected in EUR/USD which fell back below 1.10. 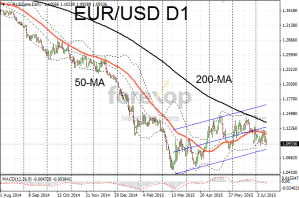 Support is expected around 1.0858. Markets were nervous ahead of a critical vote by the Greek parliament on the latest bailout arrangement. Fed Chair Janet Yellen gave some support to the dollar today after hinting that interest rates are likely to rise before the end of the year. But she also warned that the US economy faces potential risks from the turmoil in Greece and China. Economists are predicting that the first rate rise will come in September and that there will possibly be one further rise later in the year. In a separate speech Loretta Mester, the Cleveland Fed President said that the Fed can start to remove its policy accommodation now that labor markets have improved. The benchmark US dollar index climbed by 0.6% as the dollar pushed higher against the yen, the Canadian dollar and the euro. Treasury yields nudged lower after Yellen’s testimony but the movements were within the normal intraday volatility. The 10 year slipped by 5 basis points to 2.36% while the 5Y fell 3 basis points to 1.64%. The producer prices report published monthly by the Department of Labor also added to the bullish sentiment. Producer prices fell less than expected in June. According to Labor Department figures the index of “finished goods” (PPI) fell to -0.7% from -1.1% in May. The core PPI which excludes food and energy also topped expectations by rising at an annualized pace of 0.8% to June.